The house was built in 1837 by Jon Poston Figh, a city alderman and builder, for his own residence. Figh was the contractor for many Montgomery buildings, including the second State Capital building in Montgomery. After the first capital burned in December, 1849, Mr. Figh salvaged some of the square marble tiles from the ruins and used them for to floor the downstairs dining room in his home. These are though to be the only remaining artifacts from the first Capital. 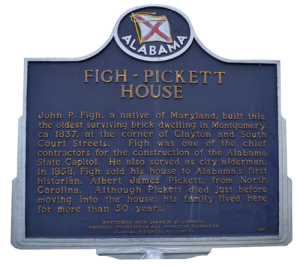 In 1858, Col. Albert James Pickett, Alabama’s first historian, bought the house from Mr. Figh, but before he was able to move in, Mr. Pickett died. His familly, however, made this their home until 1906. The building was bough in 1906 by Elly Ruff Barnes and heavily modified in order to transform it into a school for boys. Professor Barnes oprerated the Barnes School continuously in this building until it closed in 1942. In its operating years, The Barnes School graduated generations of young Montgomery gentleman. After Barnes School closed, the house was fitted with plated glass showroom windows and used as an automobile dealership. A number of other commercial tenants followed: a church, Sherwin-Williams Paint store, and lastly a convenience store known as “C.T’s Trading Post.” In 1996, when the Federal Government began its massive Federal Court House expansion, the house was given to the Montgomery County Historical Society to be used as its headquarters. As a result of the tightened security measures brought on by the bombing of the Federal building in Oklahoma City, it was suddenly decided by the General Services Administration that the house had to either be moved or be demolished. The Montgomery County Hustorical Society desperately sought a location for the house against a rapidly approaching deadline when Mr. Robert Arrington made a generous gift of two lots on the corner of Court and Mildred Streets. The house was successfully moved to this location in June 1996 and resoration began immediately under the able leadership of James W. Fuller. Today, our headquarters at Figh-Pickett is the oldest surviving brick residence in Montgomery, and the only brick house here to have ever been moved. The Montgomery County Historical Society uses the house as a repository for records and papers relative to the history of the county, and as a museum, housing artifacts from our history. The Montgomery County Historical Society is a group dedicated to saving and restoring Montgomery’s oldest existing brick house, The Figh Pickett-Barnes School House, built in 1837. By becoming a member, you will further help us preserve Montgomery’s history by assisting with the archiving and maintaining of a vast number of photographs, books, scrapbooks, and data from our past. Your investment in this noble venture will create a valuable education and research center for Montgomery County citizens and visitors. MCHS is a group dedicated to saving and restoring Montgomery’s oldest existing brick house, the Figh Pickett-Barnes School House, built in 1837. We preserve Montgomery’s history by assisting with the archiving and maintaining of a vast number of photographs, books, scrapbooks and data from our past. Our extensive archives and reference material library are available for historical and genealogical research. We will also store and protect you own family archives in our controlled environment. To fervently seek, collect, preserve and display the relics of the past, both data and artifacts of all of the people and places of Montgomery County, Alabama, so that the public might be educated and have a better understanding of the wonderful past of our community. Our extensive archives are available to members for research purposes. We have an extensive library of reference material for historical and genealogical research. Our members help us preserve Montgomery’s history by assisting with the archiving and maintaining of a vast number of photographs, books, scrapbooks, and data from our past. Please consider joining us! Built in 1837, the Figh Pickett-Barnes School House is the oldest surviving brick residence in Montgomery. We were founded in 1992 and have seen numerous accomplishments and success stories in discovering, recovering and preserving Montgomery County History, including moving and restoring the Figh Pickett-Barnes School House. We will store and protect your family archives in our controlled environment, ensuring they will last for many generations to come.